Do you have sewing patterns spread all over the house? Have your kids started using them as coloring pages or walls for forts? Can you even find your sewing machine under all that mess? Well here is a quick, easy, and CHEAP way to store your sewing patterns. For just $3, you can make a place for everything, so everything can be in its place. Don’t forget to check out our sponsor, Fabric Hut at http://DadSews.FabricHut.com for great savings on fabric and THE BEST PRICE on Juki machines online. 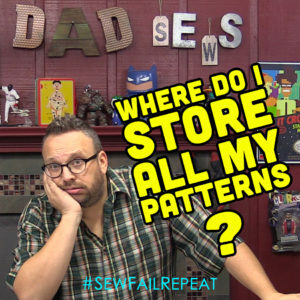 For more sewing tutorials, check out DadSews.com.